Naturally, this intrigued me! Who was Duldul, to be named this way? Who was Ali? I set off on a fun few days of research, and learned that Duldul was the favoured mule of the prophet Muhammad – the “first mule seen in Islam”. Ali was Muhammad’s son-in-law, who looked after Duldul in her later years. I wrote up my extremely amateur findings here, just for fun (you’ll note that the reason it took me so long to find the poem again is because I had completely misremembered the line!). winged, smaller than a stallion, larger than a donkey. He said the old ones said that on a time a prophet had a battle on a cliff called “Mozalan” land. The prophet was riding Dildil, he got surrounded and the cliff was on his back – Dildil could climb that cliff by sticking his hoofs on the cliff. [My grandfather] told me there are still Dildil hoofs steps on that cliff until this day. I know where that cliff is, but sadly I never went there to see the hoof steps. By the way, Dildil hoofs are not like horse or mule hoofs – they’re more like an elk hoof. Pictures of Duldul are still hard to find, and the ones I have come across all appear to show Duldul as a horse. This one has the longest ears! Here Mîsilê: ‘go to Mosul’, Mosul is a city in northern Iraq. You can listen to the song below. It’s a lot of fun – Herish said it’s mostly sung at weddings, and has a special dance to go with it. He sent me a video of the dance being performed but unfortunately it’s a Facebook video, and I can’t figure out how to share it. This was honestly one of the best messages I’ve ever had through this blog. 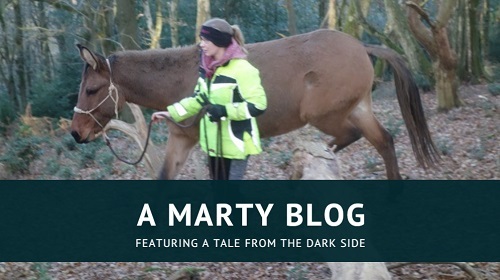 I adore folklore, and the story that Herish shared with me is the best kind – I haven’t been able to find any other sources, so it seems to me that this is a very local legend and possibly one that is only remembered by a few. Escaping danger by dexterously scaling a cliff does sound like a very mule thing to do and lends credibility to the story! The description Herish’s grandfather gave of Duldul, and the line in the folksong, is interesting; while reading about Duldul I found that she was often associated with a creature named the Buraq – in some cases the Buraq and Duldul seemed to be interchangeable. I am not sure if this is part of Islamic lore or if there are just a lot of people as confused as I am about the identities of these two creatures. In relation to this topic, the parts of the Buraq’s legend that are interesting is that he is a male creature*. 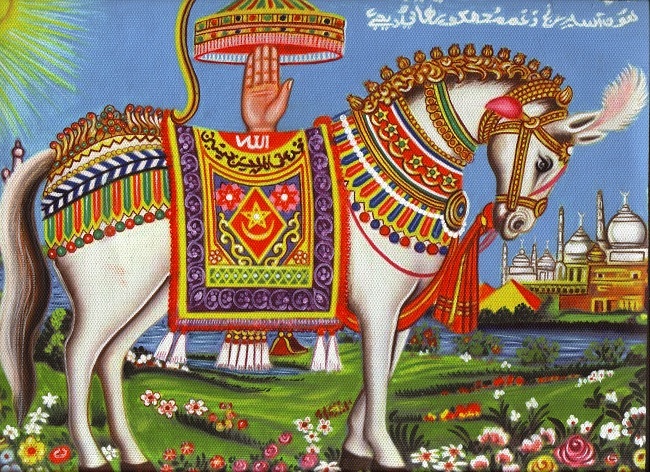 The Sahih al-Bukhari (one of the six major hadith collections) describes the Buraq as “a white animal which was smaller than a mule and bigger than a donkey”. Certainly sounds like a familiar description, doesn’t it? * Although first century scholar Ibn Sa’d has the angel Gabriel refer to the Buraq as female, and who are we to argue with an archangel? 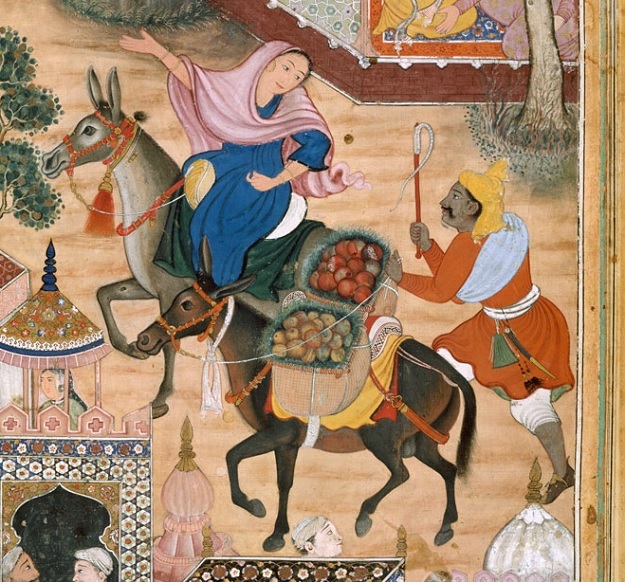 One of my favourite references to the Buraq – and one that backs up the notion that he may be a derivative of Duldul the mule – is a story that tells how he bucked the first time Muhammad got on him. Gabriel, who is apparently well-versed in the ways of mules, places a weary hand upon the Buraq’s mane and calmly asks, “Are you not ashamed, O Buraq?” The Buraq was ashamed, and this prompted him to sweat profusely before standing quietly and allowing the prophet to mount. I think I might try that with Marty. 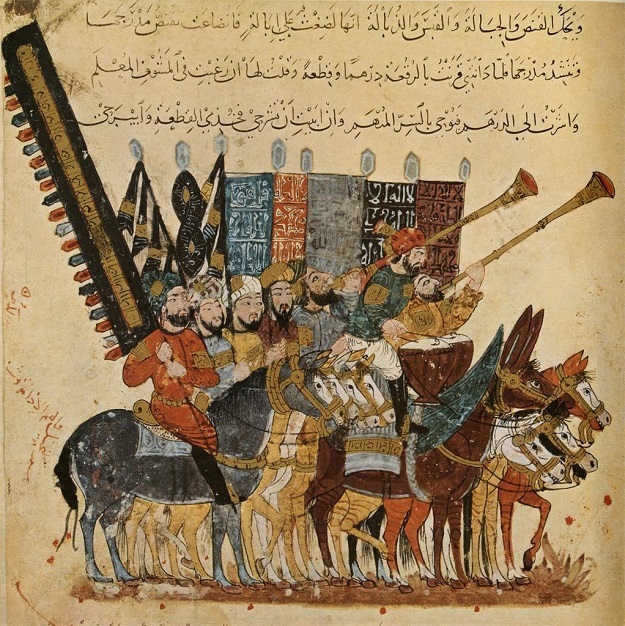 A detail from “The Spy Zambur Brings Mahiya to the City of Tawariq”, a 16th century image featured in the Book of Hamza. The Metropolitan Museum of Art referred to these as donkeys, but they look very mule-like to me! 13th century art by Yahya ibn Mahmud al-Wasiti, found in the pages of a copy of the al-Maqāmāt al-ḥarīriyah (The assemblies of al-Hariri) by Abu Muhammad al-Qasim ibn ‘Ali al-Hariri. Note the drum mule in the centre! A compendium of all possible depravities [and impossible to translate decently], but to be guessed at by fox-hunters who remember what Reynard is said to do when hard-pressed by the hounds; excusable in his case as a means of self-defence, but in the mule sheer wanton mischief at the cost of harmless passers-by. There is also mention of Abu Dulâmeh having immortalised his mule, but what that means will probably have to be the subject of another post entirely. 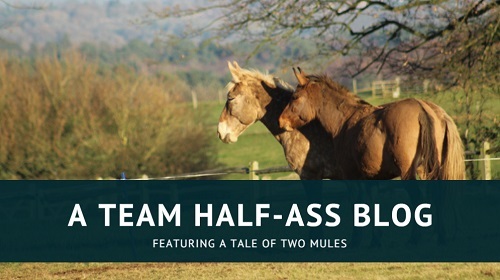 “Sheer wanton mischief at the cost of harmless passers-by” is absolutely a phrase to be associated with mules and I think I need it on a t-shirt!